ITANAGAR, Mar 19: The Arunachal Pradesh Money Lending Regulation Bill received objections from the Self Help Core Committee (SHCC) as it demanded that the government review the Bill immediately before it goes to the governor for ratification. 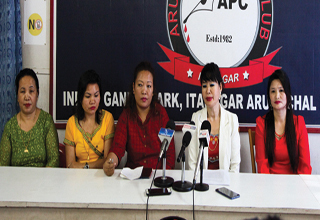 The SHCC, which largely consists of women, is a newly created body of money lenders in Arunachal Pradesh, mostly active in Papum Pare district. Speaking to reporters here at the press club on Monday, the SHCC raised concerns that there was no consultation with the lenders by the government before the Bill was passed on the floor of the house on 16 March, 2018. While the SHCC members were willing to comply with the new legislation, they sought that the government first assist them in retrieving all the previous dues with the original rates of interest before implementation of the Bill. “The SHCC members are ready to register and be licensed money lenders, but the maximum interest rate should be fixed after a joint sitting with the lenders and representatives of the government”, the members said. Chairperson of SHCC, Tunun Soki also pointed out that the Bill has listed punitive measures against the lenders but none against the defaulters of the loans, and sought that the government look into it as well. Soki also briefed on how money-lending in the state began as a mode of helping people during emergencies. “Lenders provide quicker and less complicated loans to the borrowers as opposed to other financing institutions, such as banks. This ease of access to loans has helped many patients and businesses to grow”, Soki added. Spokesperson of the SHCC, Millo Asung said, “This bill encourages the borrowers to default. The government should take measures to ensure that the borrowers pay back as this is a source of employment, especially for women”. The committee claimed that many debtors are also awaiting the implementation of the Bill at the earliest in hopes that they would be relieved from paying the interest amount. On the use of violent or extreme measures while retrieval of loans, the SHCC stated they condemn any form of violence or use of force and such incidents should be reported to the authorities. The committee however, maintained that any deposit as security from the borrower comes willingly, and such securities are needed to deter defaulters, especially strangers. There are about 158 different funding groups in the capital alone, informed the SHCC, adding that each funding group provides different rates for different individuals. It claimed that medical emergencies are given compensation, while contractors and businessmen pay the highest interest rates (10%). They, however, agreed that compound interest should be abolished. Reiterating that there should be a review of the Bill, the SHCC said that it was ready to give the names of all their debtors if the government was ready to assist in retrieving the loans before implantation of the Bill. According to the Bill, all money lenders must register with the government and the government would appoint the Registrar General of Money-Lending, along with Divisional Registrar, District Registrars and Assistant Registrars to look after the affairs. Further, money lenders will be given license to carry out money-lending business, except in the area for which he has been granted a license, with terms and conditions. Section 31(i) says, the state government will notify the maximum rates of interest to be charged by the money-lender in respect of secured loan and unsecured loan. “No money lender shall receive from debtor any sum by way of compound interest on a loan advanced or intended to be advance or any sum by way of interest rate at a rate higher than the rate of fixed under sub-section(1)”.